Some people believe that people should be grown up before they are baptised but in St Hilary's all children can be baptised as babies if their parents so wish it. Clarissa Elizabeth is the baby daughter of Rev Ken and Poppy is her older sister. 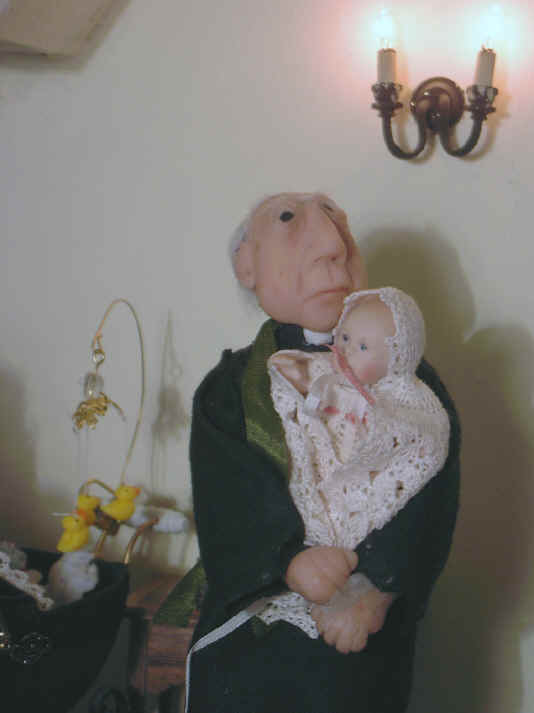 Rachel Ann is the first born child of Miss Esther and Mr Stephen who had celebrated their wedding in St. Hilarys. Clarissa's mother has brought her along today because she is going to be baptised. 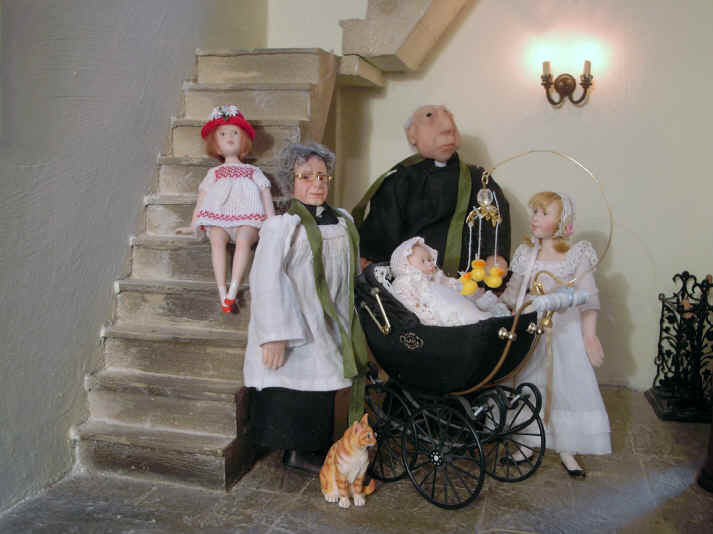 As you can see baby Clarissa is joined by her father, the Rev Ken, her older sister, Poppy, who is sitting on the stairs for a good view, and the vicar with Alice who has agreed to be one of her Godparents. You can see that Clarissa is wearing her very best here! Her carrying cape made of pure silk! The vicar has bought her a wonderful baby in-pram entertainment system in the form of a duck mobile to make sure she doesn't get upset or bored. 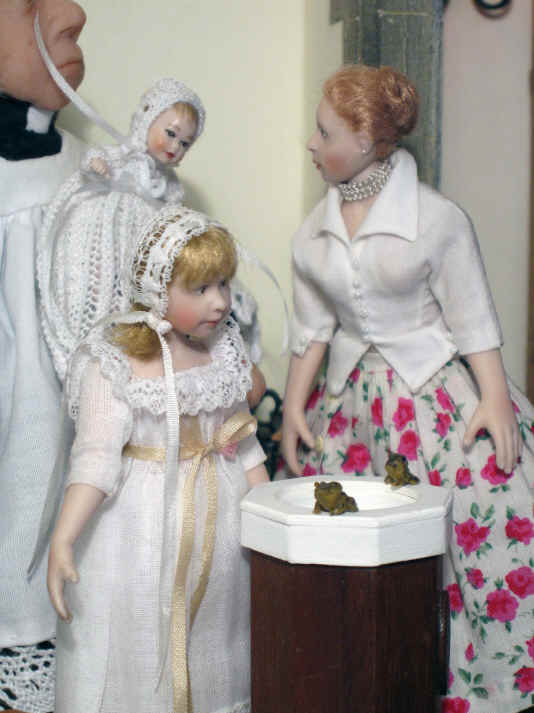 "Clarissa Elizabeth I baptise you in the name of the Father, and of the Son, and of the Holy Spirit AMEN"
The vicar poured a small amount of water over Clarissa's head three times, to signify the Father, Son and Holy Spirit. He dipped his finger into the water again, and signed a cross on her forehead. He then said: "I sign you with a cross, the sign of Christ". Baby Clarissa was very good and didn't cry once! 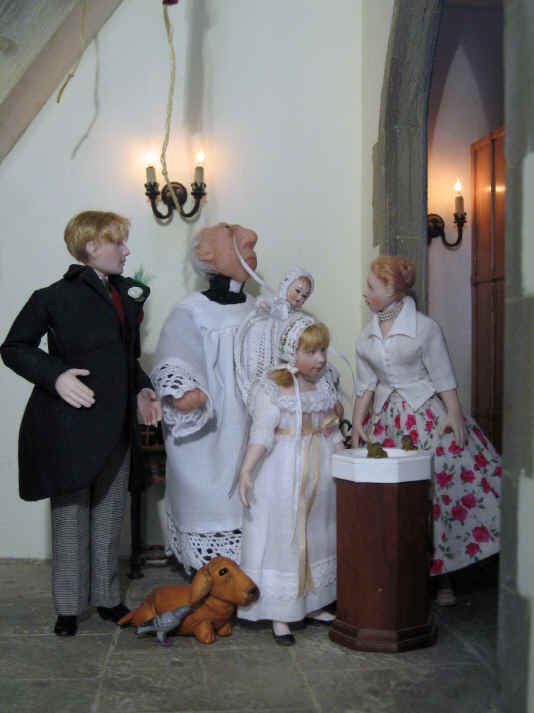 Unfortunately baby Rachel Ann had a rather more adventurous baptism courtesy of three little characters who decided to join in the ceremony! Stephen insisted on wearing his bridegroom’s outfit for his first child's baptism! He told Esther that he was wearing it because this baptism day of their first born made him just as happy as he was on their wedding day! You will all notice that we have another new character join St. Hilary's! It is Bardsley! Bardsley is Bishop Cuthbert’s dog! Unfortunately the bishop is away on a long sabbatical at the moment so Stephen and Esther offered to look after Bardsley whilst he is away. Rita, St. Hilary's resident "lady of the road", is resting at the top of the first flight of the stairs to the bell tower. 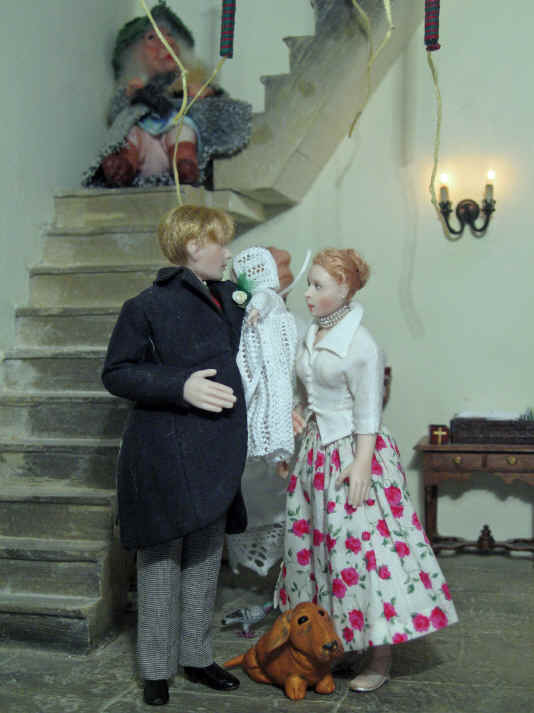 The vicar is quite happy to let her watch the baptism of Rachel Ann as he knows she has been outside for quite a while and needs to rest. Stephen has passed Rachel Ann over to the vicar so that he can baptise her. Alice has joined them as she wanted to see how it all went. Has anyone noticed two other little characters who have joined them? A lady and gentleman frog has decided to check the font out! The vicar had already blessed the water and poured it into the font. It would appear that this pair of frogs really believes that this may be a good place to have their frogspawn when Spring arrives! Oh dear - but isn't it just as well that Alice has already spotted these two miscreant frogs? Bardsley and Syd, the pigeon friend of Homer enjoy a little chat to the two frogs after they jump off the font. The vicar was then able to carry on with Rachel Ann's baptism. Godparents are people chosen by the parents who will also promise to make sure that the baby is brought up within the church as faithful Christians.